The latest edition of the US Passport exhibits what appears to be an Orwellian effort to deny the damage to the American dream our country has suffered in the last few years. Not content to spin the television news, the major newsprints and magazines, the US government has conjured up new travel documents that can only be considered a premeditated leap into a propagandistic fairyland. 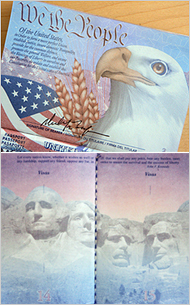 A fearsome eagle is emblazoned across the photo page, which in prior editions demurely depicted only a photo of the passport holder, name and place of issue. One enters the new passport experience to find page after page of anachronistic American hype. Sprawled across the formerly blank visa pages, one now encounters Mt. Rushmore, the Mayflower, The Declaration of Independence, more bald eagles communing with buffalo and the obligatory Statue of Liberty, to name a few of the tried-and-true patriotic symbols of an American dream that has been reduced to rubble. Each page of the new “spun” passport also contains a statement from one of America’s statesmen or visionaries of yore, including a few who may have been assassinated for trying to bring the American dream to fruition. You got it–John F. Kennedy intones, from beyond the grave to “Let every nation know, whether it wishes us well or ill, that we shall pay any price, bear any burden, meet any hardship, support any friend, oppose any foe, in order to assure the survival and the success of liberty.” On November 22, 1963, in Dallas, Texas, JFK paid that price. Similarly, Martin Luther King, another one of the victims of the rash of sixties’ political murders, boldly states that “We have a great dream. It started way back in 1776, and God grant that America will be true to her dream.” Well, Martin, you were as true as they get, all right. I hope you and the Kennedy boys are not getting apopleptic about what has transpired in the last forty plus years, up there in the Big Peace Rally in the sky. George Washington also makes an appearance, exhorting us to “raise a standard to which the wise and honest may repair.” The judges in our courts, who are now with shocking regularity violating statutory and constitutional law, might like to revisit that one. The new passport is inclusive and egalitarian. The Mohawks have their soundbite here, declaring that “We send thanks to all the Animal life in the world. They have many things to teach us as people. We are glad they are still here and we hope it will always be so.” The fact that the American Indians were the first victims of what is now commonplace American genocidal policies is not mentioned here. Given the recent disclosure of the plans by the US Department of Navy to “take” (kill) over 2 million marine animals in war training exercises off the Pacific Coast, looks like the hopes of the Mohawks have ended up in the burial grounds. Not to worry, ladies. You too have a representative voice in the pages of the new passport. Anna Julia Cooper, author, educator and daughter of a slave, reminds us that “The cause of freedom is not a cause of a race or a sect, a party or a class–it is the cause of humankind, and the very birthright of humanity.” I’d sure like to hear from all the vulnerable widows who were funneled into conservatorship programs, stripped of their property and their rights, then drugged to death in nursing homes as to how Cooper’s vision played out for them. Hold on a minute here. “Sensitive electronics?” Could it be that the new passport, trumpeting the sanctity of our freedoms and liberties, actually contains a microchip? Could it be that this passport therefore contains a surveillance/tracking device? And is that spy satellite on the opposing page actually one of those satellites that can track RFID microchips? And all this while I thought that the new passport was merely an exercise in verbal “spin.” Could it be that this piece of thinly disguised propaganda is another means to tag, track and locate? The initial efforts at creating identification systems in the US began as a means to identify runaway slaves. In otherwords, human property. Strange, I don’t see anything about the history of slavery in this new passport. And what’s the real intent of this micro-chipping frenzy anyway? Could it be that….OMG!! The passport is…AARRGHHH…I can’t breathe….call 911….NO, DON’T CALL 911!! Get me a chaplain, a doctor, paramedic, anyone QUICK! !